« Do Loved Ones Become Our Spirit Guides? A senior lady in our neighborhood, who noticed my interest in charms and found objects, encouraged me to work with milagros and ex-votos. They are religious folk charms that are traditionally used for healing purposes and as votive offerings in Spanish and Latin American culture. Milagro means ‘miracle’ in Spanish, and ex-voto means ‘from the vow’ in Latin. They are traditionally offered to a deity or saint as a form of prayer or a wish, or in thanks for desires fulfilled. 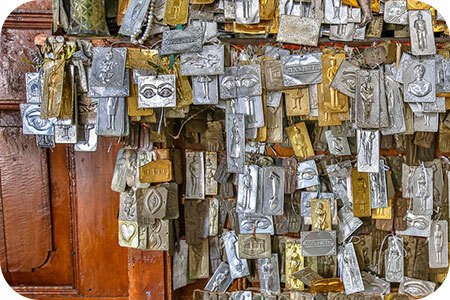 They are typically attached to altars, shrines, and sacred objects found in places of worship. They are made of from different materials, such as tin, wood, silver, gold, bone or lead. Milagros can also be carried for luck or protection, and incorporated in jewelry. Sometimes a written prayer is attached. Heart – A petition for a heart problem, prayer for romance, to heal a broken heart. Angel – The Holy Guardian, protection, messenger. Winged Heart – Freedom given from unconditional love. Hand – Friendship and love. Healing touch or healing of an actual hand ailment. Fish – To cure infertility and for pregnancy. To have enough to eat, a blessing, money, luck. A sign for the unconscious, insights coming to the surface. Spirituality (a fisher of men from the writings of Matthew in the Bible). Car – Safe travels, vehicle repair or replacement or the courage to move; going forward. Animals – health of the animals you tend. Note that one can assign any meaning to your charms or milagros, because it’s all about our intention for this particular charm and how we are going to use it.